A technology that can be defined as miniaturized mechanical and electromechanical elements. In the context of this study, we typically refer to different kinds of mechanical sensors, like pressure sensors, gyros, ultrasound transducers, accelerometers etc. MEMS are often also referred to as “Microsystems Technology” or “Micromachined Devices”. The art of combining sensory data from disparate sources, to information with less uncertainty than would be possible when these sources were used individually. Our client wanted to develop a compact, low-power, high-performance multisensory device with sensor fusion capability for maritime applications. The company had an aggressive time plan which gave the project a few months to complete. Provide the system with enough computational power to execute the clients advanced algorithms. Implement a physical interface for connecting the sensors to the backbone. Develop framework software running on the hardware. Create an easy-to-use testbed to be used when integrating the system and possibly by the client when implementing and tweaking their algorithms. The “backbone” was then intended to be mounted in a housing designed for harsh, maritime environments, together with sensors and other hardware supplied by contributing projects. The client is a recently formed company with a vision to develop a new generation of sensor systems targeting the maritime market. The sensors combine modern MEMS-sensors, new small form factor computational hardware and advanced algorithms, to fuse sensor-data from multiple sources to obtain extremely high-performance sensor output. The client realized that the MEMS sensor technology has taken huge steps lately, and so has affordable computation power in form factors suitable for extreme and hostile environments. Their idea is to bring powerful algorithms to the table, algorithms that can capitalize on these new hardware resources, and integrate them to create a new generation of high-performance sensors. Small form factor. On the decimeter scale. High performance. Resolution about ten times better than that of competitors. Short time-to-market. A few months. And, of course, a competitive price. Our client did a thorough investigation to find the hardware and software platforms that could fulfill the requirements above. They also wanted to ensure that they could find a partner that would be able to help them develop those of the components that lay outside their core expertise, i.e. the “backbone” of the system. Use the “CompactRIO System On a Module”-platform, or SOM, from National Instruments (NI) as the hardware platform. Use LabVIEW as software development tool. The SOM paired with LabVIEW would guarantee a seamless integration of software with hardware. Find a partner through National Instruments Alliance Partner Network to help develop and integrate the backbone. As with all National Instruments hardware, the SOM integrates tightly with LabVIEW, their own software development tool. LabVIEW provides a homogeneous software suite for developing code for the FPGA, for the ARM processor, as well as for an external PC if you want to connect that to the system. One language to rule them all..
Design a carrier board defining the I/O of the backbone. Develop software for the FPGA. Develop software for the ARM processor. The carrier-board is attached to the SOM by the 320-pin SEARAY connector. It has miniature connectors for the sensors and an additional connector for power supply, host communication and surveillance I/O. All power distribution to SOM and the sensors are made through the carrier board using isolated DC/DC supplies. This galvanic isolation between the different devices provides an extraordinary robustness against electromagnetic interference. Beside the isolated DC/DC power supplies, the carrier board contains specific circuits for galvanic isolation for signals passing between SOM and external connectors. There are also specific circuits for handling of the signal levels used for RS232, RS485 and Gigabit Ethernet. The carrier board was designed and manufactured by WireFlow in less than two months. Besides delivering a set of carrier boards WireFlow also created a socketed CLIP specifically made for the carrier Board. This Socketed CLIP together with LabVIEW code snippets made it easy to get the sensor fusion algorithms to interact with the sensors and electronics connected to the SOM. WireFlow also developed a small testbed that performs basic sensor simulation and provides a host interface to the motion sensor. By using this testbed WireFlow and the client could integrate the algorithms, LabVIEW software drivers, SOM and the custom carrier board in a very short time. By selecting this combination of hardware platform, software development tool and partner, the project could, right out of the box, start working with a coherent, highly integrated platform. WireFlow and our client could in a very short time implement the vision of a state-of-the-art sensor system at a fraction of the size, weight, power consumption and cost, compared to the competition. 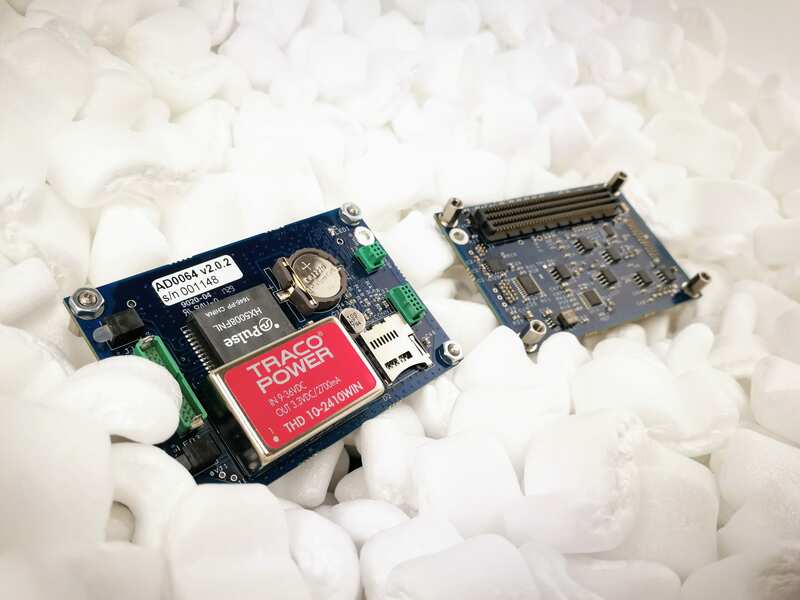 The SOM is basically a bare board with an FPGA, an ARM processor with a real-time Linux OS and a high channel density connector for a customized carrier board to define the physical I/O for your specific application. 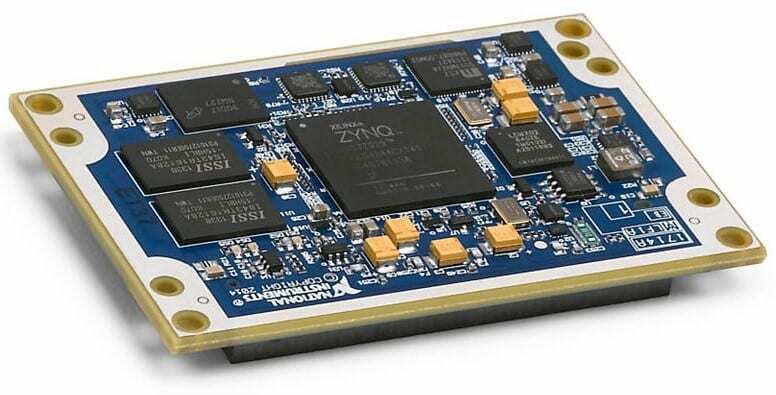 It provides the extreme performance of the FPGA, combined with the real time capability and openness of the ARM-processor as well as direct access to all pins. Everything is programmable with LabVIEW. The solution requires that you design a carrier board to dock with the SOM that assigns pins to your specific application. Figure 1. National Instrument’s CompactRIO System On Module. Using products from NI also ensures access to the “NI Alliance Partner Network”, i.e. companies that NI acknowledge to be “uniquely equipped and skilled to help solve some of the toughest engineering challenges” using NI’s products and frameworks. WireFlow is an NI Alliance Partner. WireFlow is also recognized by NI to be an Embedded Specialty Partner, which means that we “have demonstrated architect-level proficiency with LabVIEW software and the LabVIEW Real-Time and LabVIEW FPGA modules“. This is a match made in heaven and WireFlow was selected to be the partner to implement the NI-based backbone. Figure 2. The Carrier-Board developed by WireFlow.